With neatly stacked foliage around a central stem Crassula perforata ‘Variegata’ looks a little like buttons on a string, hence the common name. This succulent sends up tall stems, green and creamy yellow in colour with flushes of red on the margins in cooler weather and when under stress. Grown in a container it looks great when used indoors where the towers of foliage attract interest. The variegation is more intense on the upper foliage in most cases. Grow Variegated String of Buttons in good filtered light indoors in a container with free draining potting mix. Over time the plant will send out suckers and form a dense colony, in the garden it will scramble over other small plants, so stick to container growing with this one. Or consider using it as a ground cover plant in a contained area. Use a free draining growing medium. Water only when the growing medium is dry. Do not allow the plant to sit in sign soils, or in saucers of water. Only minimal fertiliser is required, a 1/3 strength low nitrogen fertiliser applied every 2 – 4 weeks when the plant is in active growth should prove adequate. Repot every 3 – 4 years in late spring. As this is a suckering plant, propagation is easy by removing offsets. 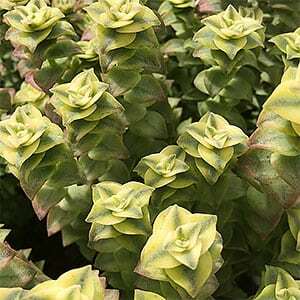 It is also possible to propagate Crassula perforata ‘Variegata’ from leaf cuttings. Foliage – Green/Yellow, edges will turn red at certain times. Flowers – Small. yellow to white.